An abused wife, a mother who’s children died, a widow of a murdered husband, and finally, a nun, Saint Rita experienced many lives in her time on earth. Knowing the powerlessness and despair of those in bad marriages she is invoked for help in desperate times. In her own lifetime she was famous for the power of her prayers to change any situation and it was said that she could accomplish the impossible. Canonized almost 500 years after her birth, she is the first declared female saint of the 20th Century. Margarita Lotti was born to an older farming couple in Roccaporena, Italy. She was called Rita because of a vision of an angel her mother had who named the baby while declaring, “You will give birth to a daughter marked with the seal of sanctity, gifted with every virtue, a helper to the helpless and an advocate of the afflicted.” As proof of this prophecy, bees, a sign of divine presence, always hovered over her crib as she slept, never harming or waking her. Though she had always wanted to be a nun, Rita’s parents feared for her future security as there was a schism in the church and many religious orders were closing their doors. Instead, she had to accept a marriage they contracted for her with a man named Paolo Mancini. Though he was a good provider, he soon proved to be an abusive, promiscuous husband. Settling his personal disputes with violence, Mancini created a tense family environment for Rita and the two sons she had with him. Never wavering in her devotion to God, Rita prayed that her husband would change his ways. After 18 years of marriage, Paolo had a vision of himself as others saw him and begged for his wife’s forgiveness. A lifetime of enemies caught up with Paolo and he was murdered, his mutilated body dumped on his family’s doorstep. Rita begged her two teenaged sons not to pursue a vendetta against his killers, but they refused. She prayed to God to prevent her sons from murdering anyone. Both of them came down with serious illnesses and died before they could act on their vendetta. Alone in the world, Rita petitioned to join the Augustinian convent. Because several of the nuns there had family members who were involved in Paolo’s murder, the convent refused her, not wanting tensions to carry over from the outside world. Rita prayed and entreated Paolo’s family to forgive his killers. Much to everyone’s surprise, they acquiesced and Rita was admitted to the convent on her third try. While there she spent her days nursing the older nuns and concentrating on Christ’s suffering. When she begged to feel what Christ felt on the cross, a thorn from the crown of thorns on a crucifix struck her on the head and became embedded there. It left a deep wound that never healed. Because this wound became infected and foul smelling Rita was shunned by the other nuns and remained in her cell praying and meditating. The January before she died, a cousin asked her if there was anything she needed and she asked for a rose from her childhood garden. The cousin was shocked to see that there was indeed two roses growing in that garden in the middle of January. Upon her death, her cell was filled with the smell of roses. Rita is always depicted with the thorn in her head, in her Augustinian habit, meditating on the crucified Christ. Wound in the head: Divine light, grace and spiritual power. Roses: love. Also proof of Rita’s miraculous powers as her roses grew in the winter. O holy protectress of those who art in greatest need, O you who shine as a star of hope in the midst of darkness, blessed Saint Rita, bright mirror of God’s grace, in patience and fortitude you are a model of all states in life. I unite my will with the will of God through the merits of my Savior, Jesus Christ, and in particular through his patient wearing of the crown of thorns, which with tender devotion you daily contemplated. Through the merits of the holy Virgin Mary and your own graces and virtues, I ask you to obtain my earnest petition, provided it be for the greater glory of God and my own sanctification. Guide and purify my intention, O holy protectress and advocate, so that I may obtain the pardon of all my sins and the grace to persevere daily, as you did in walking with courage, generosity, and fidelity down the path of life. 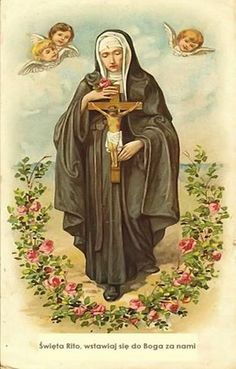 Saint Rita, advocate for the impossible, pray for us. Saint Rita, advocate of the helpless, pray for us. (Recite Our Father, Hail Mary and the Glory Be three times each). 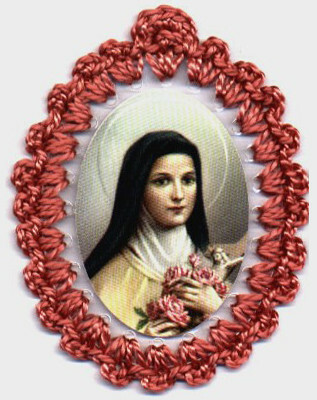 Love, roses and children are keywords for Saint Therese of Lisieux. A young Carmelite novice, Therese lived a cloistered existence in a convent only miles away from where she was raised. She died in obscurity at the age of 24, never realizing her dream of working in the foreign missions, yet she is considered to be one of the greatest saints of modern times. Therese Martin was the youngest of five daughters born to a very religious couple. At the age of four she lost her mother to breast cancer and the family moved from Normandy, France to the city of Lisieux to be among other relatives. Therese was spoiled by her older sisters and when the eldest joined the convent, she vowed to not only follow her, but to become a saint. She was admitted to the Carmelite cloister at the unusually young age of fifteen. Her sentimental fantasy of convent life was replaced by the reality of menial chores and constant prayer. She came face-to-face with her own doubts and weaknesses when she became ill with tuberculosis and her dream of doing missionary work in Hanoi was shattered Along with her diminished health, Therese had to accept the fact that she would never have the opportunity to travel the world and do great things. Feeling small and ineffectual, Therese went through a period of spiritual dryness where she doubted that her prayers were even heard. By embracing her powerlessness, she was able to transform her life and develop her “Little Way”. A personal philosophy devoted to performing small, loving acts scattered throughout her day like so many flowers. Gradually, Therese realized that there were no actions that could be considered insignificant, no matter how small. If they were performed with love, they would have great force. In 1896, while she was bedridden, Therese was ordered to write her autobiography. This self examination is part of the Carmelite spiritual regime. After her death, the book called “The Story of A Soul” was published in a small printing. It soon became spectacularly successful, as ordinary men and women were able to easily identify with its author’s struggle to accept living a hidden, mundane life. It has been translated in at least 50 languages and Saint Therese has a very active and enthusiastic following all over the world. A sign that your novena to Saint Therese is being answered is the sight and smell of roses. O little Therese of the Child Jesus, Please pick for me a rose from the heavenly gardens and send it to me as a message of love. O little flower of Jesus, ask God today to grant favors I now place with confidence in your hands. (Mention your request here). Saint Therese, help me to always believe as you did, in God’s great love for me, So that I might imitate your “Little Way” each day. Denounced by Vatican officials as a fraud, and his mystical gifts frequently viewed with suspicion by his immediate superiors, Pio of Pietracelina was sequestered away in the remote monastery of San Giovanni Rotondo where it was expected that he would labor as a monk in obscurity. His adeptness in both physical and spiritual healing and his ability to read hearts and minds while in confession made him wildly popular among the common people of that impoverished region of Italy. Today, the town of San Giovanni Rotondo is the second most visited place by religious pilgrims who venture there to pay homage to one of the most popular saints of the twentieth century, Padre Pio. Made a saint in 2002, Padre Pio has no official patronage. Because of his devotion to the powers of the Sacred Heart of Jesus and his own suffering due to the mistrust of his superiors, he is frequently invoked to bring the grace of forgiveness to a situation. Born Francesco Forlione in Pietracelina, a town north of Naples, he was named for his patron saint, Francis of Assisi. Coming from a religious family, he said he had spiritual visions of Christ and the Virgin Mary from a very young age. He never mentioned them to anyone as he assumed all people had such gifts. He was ordained as a Capuchin friar in 1910 taking the name Pio (meaning “Pious”) but was sent home due to a diagnosis of tuberculosis. While convalescing he offered himself as a conduit of suffering in exchange for the salvation of others. Eventually, in 1916 he was conscripted into the army where he contracted such a high fever that he was sent home to die. Upon his miraculous recovery from this illness, the Capuchin order sent him to the very remote monastery of Our Lady of Grace in San Giovanni Rotondo in Puglia, a province of Southern Italy. On September 20, 1918, while praying in the stillness of the church, Pio went into a trancelike state where he saw Christ standing before him bleeding from the wounds of the crucifixion. Pio’s heart almost burst in sympathy before coming out of the state in intense pain. Upon regaining consciousness he found himself to be afflicted with the same wounds of the crucifixion. It was this condition which only ended at his death in 1968, which would bring him under intense scrutiny by church officials for the rest of his life. Pio’s talents for deciphering what people meant to tell him during confession but were too embarrassed or ashamed to bring up, became immediate apparent to the local townspeople and he developed a great following among them. They credited him with an incredible capacity of healing, mending physical ills, familial squabbles, and curing spiritual desolation. When Vatican Officials severely limited his official duties, the one mass he was allowed to say at 5 AM, had thousands lining up the night before so that they may be with him. Without ever leaving the monastery, he was known as “the living saint” as he sighted in hospitals and at sickbeds hundreds of miles away. The onset of World War Two spread his cult on an international level as soldiers from Australia, other parts of Europe, and the United States witnessed his miraculous abilities. By the late 1940’s he was receiving hundreds of international prayer requests per day. He eventually founded a hospital for the hopelessly ill, the internationally acclaimed House for the Relief of Suffering, which treats tens of thousands of people each year and survives solely on charitable donations. The animosity that many Vatican officials had against Padre Pio was dissolved in 2002 when Pope John Paul II declared him a saint. This pope knew Pio’s powers firsthand as he had visited him fifty years before as a young seminarian in the hopes of obtaining a cure for a friend. Not only did his friend’s cancer go into remission, but Pio’s strange prediction of this obscure Polish priest’s rise to pope also came true. As a victim of a mentally ill father, Saint Dymphna offers much solace to those suffering from psychological problems as well as their families. She is invoked to bring peace to the unbalanced as well as create an aura of calm and consolation for those who live in the midst of instability. Having lived such a short life so long ago, there is very little factual information available about Saint Dymphna. According to a written report commissioned by the Bishop of Cambrai seven hundred years after her death, Dymphna was born an Irish princess. Her mother was a devout Christian married to Damon, a pagan king. Dymphna’s mother made sure her daughter was brought up as a Christian, having installed her own confessor, Gerebran into her household. At the age of fourteen Dymphna lost her mother and her father went mad with grief. After a period of mourning, he searched all of Ireland for a new companion but could not find a woman who even remotely resembled his first wife. Because Dymphna was almost the exact image of her mother, Damon decided to marry her and make her his queen, disregarding the fact that she was his own daughter. In order to thwart this plan, Gerebran and Dymphna escaped the castle and went abroad to Antwerp. Eventually settling in Gheel in Belgium, they lived as religious hermits. Dymphna studied to be an anchoress which was a woman who lived in a room connected to a church with a window open to the street. Towns in the middle ages usually supported these people who offered their knowledge to those in need of advice. It took Damon and his men a year to find Dymphna and Gerebran. The priest was executed immediately and Dymphna was offered her father’s kingdom in exchange for returning home with him. When she refused, he decapitated her in a rage. Both bodies were immediately buried. Since epilepsy and mental illness were all thought to be caused by demonic possession, those suffering from mental afflictions were never welcomed to live in one place and were doomed to wander from town to town. Soon after Dymphna’s death, a group of five of these social pariahs slept at the site of her murder and were instantly healed by the blood in the earth. In the 13th century, the remains of an unknown man and woman were accidentally disinterred at Gheel. The name DYMPNA was written on a brick over the woman’s remains. As the remains were reinterred in a tomb, miraculous healings of the mentally ill and epileptics in the region were recorded. Gheel became a pilgrimage site for anyone suffering from any form of mental illness. By the end of the thirteenth century a major hospital and treatment center was built there for those suffering from nervous disorders. To this day, Gheel offers the most advanced and humane treatment for the mentally ill in the world. Saint Dymphna’s remains, in the church named for her there continues to be a place of pilgrimage. O God, we humbly beseech you through your servant Saint Dymphna, who sealed with her blood the love she bore you, to grant relief to those who suffer from mental afflictions and nervous disorders, especially (mention the afflicted person). 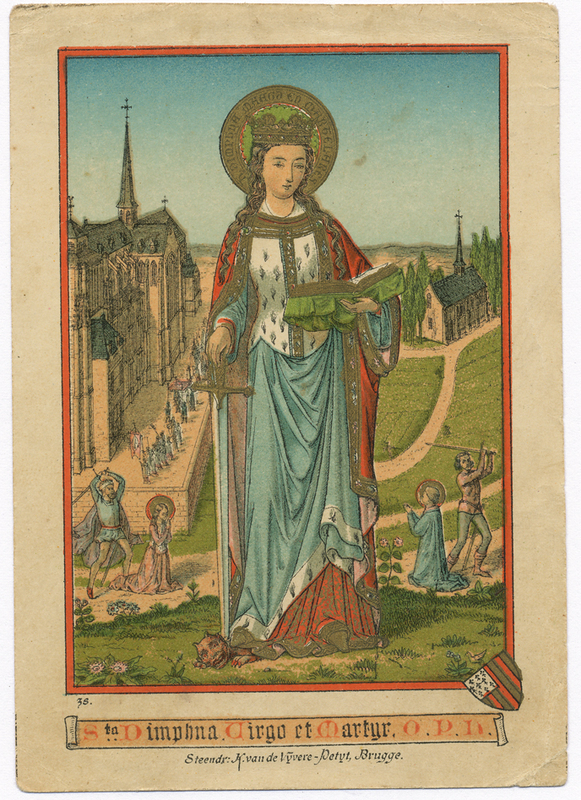 Saint Dymphna, helper of the mentally afflicted, pray for us. Saint Dymphna, comforter of the despondent, pray for us. Saint Dymphna, renowned for many miracles, please hear my plea.